Are you always on the search for new Paleo recipes because you are stuck in a rut? Have you tried lots of the Paleo recipes out there, only to waste your time and expensive ingredients because the recipe is just not all that good? I’m Rebecca and I am the author of MyNaturalFamily.com. I started eating Paleo over 10 years ago after discovering that I had a lot of different health issues, which led me to discover that I had multiple food allergies. After I went on an elimination diet to try and figure out was what I was allergic to, I discovered that the foods that were left were Paleo foods. I lived the Paleo lifestyle for years and created my own recipes before the Paleo diet existed because I couldn’t find any recipes that worked for me. Imagine my surprise when I started blogging several years ago and found the Paleo diet. 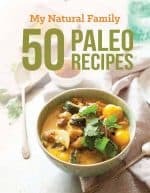 Since then I have created many more Paleo recipes and I’m happy to share them with you in this book. I’ve spent years experimenting with different Paleo ingredients finding the perfect combinations so your food actually tastes good. You will find a wide range of recipes in my book, from simple, quick breakfasts to quick weeknight dinners to more complicated recipes for the weekend that I hope you will totally think are worth a little effort. You will find that much of the success of Paleo recipes is in the technique and the mix of several different Paleo flours so you get the taste and texture you are used to. You will find foods that you can bring to family parties that are Paleo, but people (like my dad) who would never consider eating Paleo, will eat and not even realize that they are Paleo. There are recipes your whole family will enjoy so you do not have to cook separate meals. Some of the favorites that I love to cook on a regular basis for our family of six are the egg muffins, mac ‘n cheese, meatloaf muffins, pizza, sloppy joes, peach rosemary chicken, fajita salad, curry, tikka masala, snickerdoodle cupcakes and the lemon bars. I hope that you too will find lots of favorites that become staple Paleo recipes in your house. Each recipe includes a link to MyNaturalFamily.com so you can easily find it on my blog, read my comments, read other’s comments, ask a question and see other images. 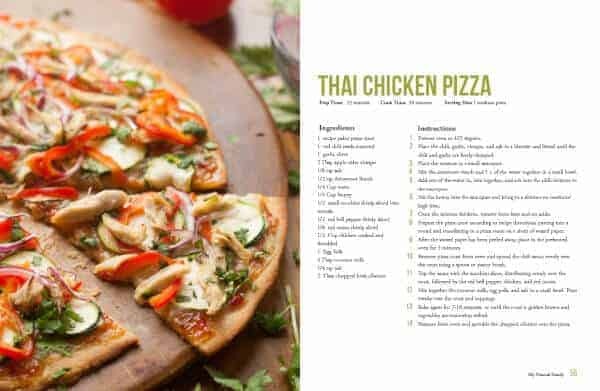 Each recipe is complete with a full color image, ingredient list and instructions. Here is a peak at the table of contents, to give you an idea of what categories there is. 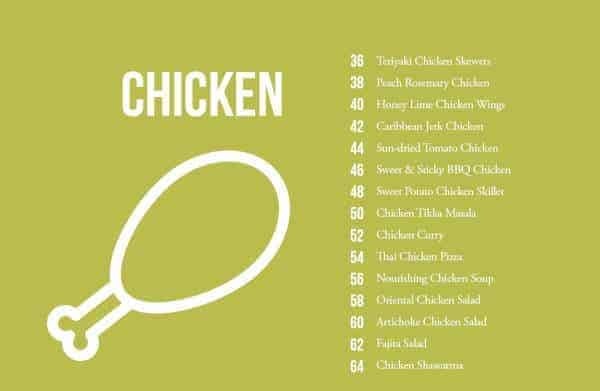 This is a sample page of the chicken table of contents so you can see all the chicken recipes that there are. This is an example of a recipe, so you can see how it has beautiful full-color images and the recipe clearly laid out. There is even a link to go to my blog and read more notes, instructions and comments from other readers if you want. 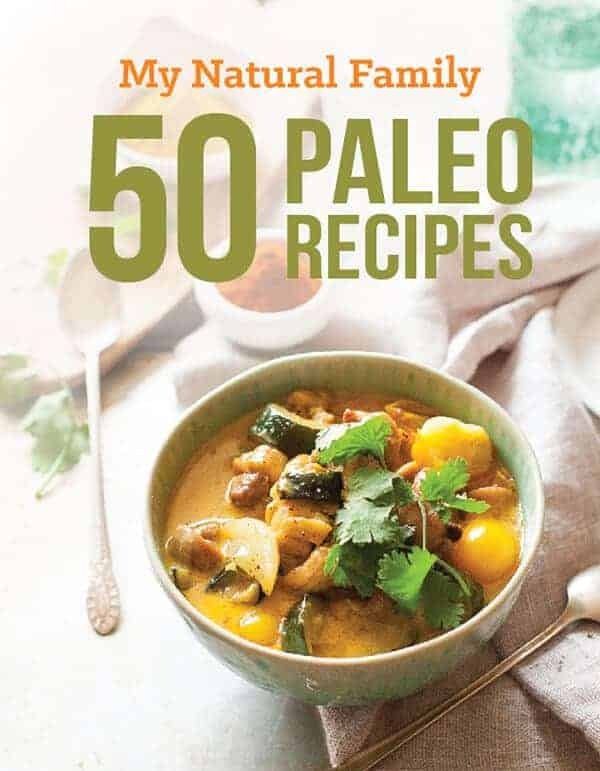 Food will never be the same with this eCookbook of 50 Paleo recipes. We have everything type of recipe for you – including breakfast, meat, chicken, sauces, vegetable dishes, and desserts. If you are trying to get started with the Paleo lifestyle, this is a great place to start. It is also great for people who already eat Paleo and want to add variety to their diet.